Tamil Nadu Public Service Commission (TNPSC) has released interview schedule on official website for those candidates who had qualified in document verification schedule which was conducted from 30th March 2015 to 07th April 2015 for 183 posts of HO in Tamil Nadu. The interview schedule is going to be held from 01st June 2015 to 04th June 2015 at venue at the Office of the Tamil Nadu Public Service Commission, Frazer Bridge Road, Chennai - 600 003. Those candidates who had qualified in this document verification and waiting for Oral Test schedule they can download oral test schedule from the direct link provided below. 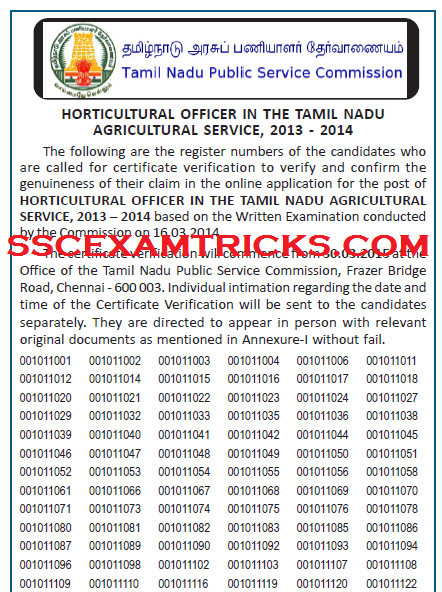 Tamil Nadu Public Service Commission (TNPSC) has released written examination result on 13th February 2015 which was conducted on 16th March 2014 for a total of 183 posts of Horticultural Officer in the Tamil Nadu Agricultural Service on the official website. The shortlisted candidates are called for Document Verification Schedule which will be started from 30th March 2015 at the Office of the Tamil Nadu Public Service Commission, Frazer Bridge Road, Chennai - 600 003. Individual intimation regarding the date and time of the Certificate Verification will be sent to the candidates separately. They are directed to appear in person with relevant original documents as mentioned in the end of the posts. After completion of certificate verification, the eligible candidates alone will be called for the Oral Test in the ratio of 1:2/1:3 satisfying the rule of reservation. The intimation about the document verification along with a list of required documents, date, time & venue of document verification are being sent through speed post to all the successful candidates. Candidates are advised to bring their original document along with at least two set of photocopy of the entire original document for the verification of originality of the candidates. No candidates will be allowed to attend the document verification schedule on coming late and without mandatory original document. The list of original document which are required at the time of verification is available in the end of the posts. Earlier TNPSC had released notification advertised online from 17th December 2013 to 16th January 2014 for a total of 183 posts of Horticulture Officers in Tamil Nadu Agriculture Service. The last date for payment of application fees was 18th January 2015. A huge numbers of candidates had appeared in written examination and waiting for result; they can download their result from the direct link provided in the end of the posts. Tamil Nadu Public Service Commission consisted of three successive stage of exam. First stage Preliminary Exam, Second stage CPT and third Personal Interview. The Written Exam was conducted on 16th March 2014. The Written Examination was conducted on Computer Based Test Format for paper 1 (Horticulture) in Forenoon Session from 10.00 A.M. to 01.00 P.M. and Paper – II (General Studies) afternoon session from 02.30 P.M. to 04.30 P.M.
All the selected candidates must reach the venue of Interview at least 20-30 minutes before the time mentioned (i.e. 9:00 AM Sharp) on the intimation letter of the candidate. Selected candidates are required to bring print of application, result print, original documents (10th, 12th, UC DMC, Cast certificate –If applicable etc.) and one set of self-attested of all the documents to the venue of document verification. 10th Certificate is used for Age Proof. Candidate must bring at least one Address proof i.e. PAN Card, Ration Card, Aadhar Card, Voter card or Driving License. Candidates are advised to bring two extra colored recent passport size photograph (same as pasted on computer generated application form) required for application form or other document requirements. Candidate must bring Caste/PWD/EXS certificate to claim for seat available for reserve category. If the candidate is an employer of any organization then it is mandatory to bring original as well as photocopy of NOC (No Objection Certificate) with them. 3. Evidence of qualification in Tamil: SSLC /PUC/ HSC/Degree in the case of candidates who have passed the said examination(s) with Tamil as one of the languages (or) Evidence for having passed the Second Class Language Test (Full Test) in Tamil. 4. Community Certificate: Community Certificate from the competent Revenue authority as specified in para 15 (f) of the Commission’s ‘Instructions to candidates’. 5. Evidence for Religion: Community Certificate / Transfer Certificate. 6. Last Studied Conduct Certificate: Certificate of character and conduct obtained from the Head of Institution in which he / she last studied / studying. 8. Photographs: Three copies of recent passport size photographs.